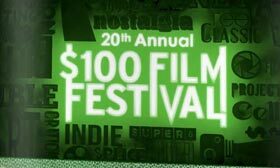 This year mark’s the amazing 20th anniversary of $100 Film Festival, making it Calgary’s oldest film fests and one of the last ones devoted solely to film. The cinematic fun will run at the Stanford Perrot Lecture Theater on March 8-10 with three nights of short movies produced on 16mm and 8mm film. What began as a modest affair simply to promote local filmmaking efforts, the $100 is now an international festival with movies this year from the U.S., Germany, Spain, Japan and, of course, Canada. The fest is also celebrating the work of American filmmaker Robert Todd, who will be on hand to screen some of his movies as well as host a workshop on experimental documentary filmmaking techniques. Each night of the festival kicks off with a live music and film performance. The first night features the a jam film by local filmmakers Brenda Lieberman, Luke Black, Caitlind Brown, John Frosst & Brennan Tilley accompanied by music by Jesse & the Dandelions. The following two nights will then open with a film by Gillian McKercher and music by Jasmin PoonBy; and a film by Keely Bruce with music by Geist. Some highlights of the fest also include the experimental animations The Future Is Bright by Jodie Mack and Clouds by Ben Popp; the artistic underwater documentary Caridea and Ichthyes by Paul Clipson; and the electric I Own a Carousel by Lori Felker. The full festival lineup is below, but for more info, please visit the official $100 Film Festival website. Creeper, dir. Keely Bruce. Music by Geist.